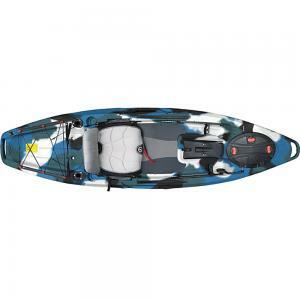 Choosing the best fishing kayak under $1000 is easy when you know what to look for. Buying a cheaper kayak doesn’t have to mean missing out on a great paddle and plenty of options to help you hook the catch of the day! For enjoyable days fishing on your favorite lake or river, there a few things to consider. These include storage space for your gear and appropriate weight capacity. You also want to ensure your yak is stable to avoid tipping, as well as easy to maneuver. Here’s a look at five of the best fishing kayaks under $1000, to help you buy the right one for you. 1.1.0.0.1 Can’t get enough of fishing kayaks? Check out the Best Hobie Fishing Kayaks. Our number one pick is the Ocean Kayak Prowler 13 Angler. It’s one of the first kayaks specifically designed for fishing and the Prowler 13 remains a top-rated fishing kayak today. 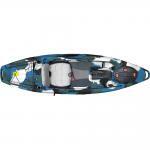 The single-user SOT kayak is 13-foot in length and 28-inches wide, with a 17-inch wide seat. The kayak length accommodates leg lengths of 52-inches or less. A 475-pound maximum weight capacity allows for larger paddlers and extra equipment. You can store fishing equipment in the 16.5 x 10-inch click seal, a watertight hatch that opens and closes with a single click. Extra storage comes in the bungee secured, extra-large tank well and a cam locking hatch system. Bungee cord deck connectors and side-mounted paddle keepers securely lock paddling equipment in place. Added features for your fishing enjoyment include two flush mount rod holders and two molded-in bottle or cup holders. The scupper holes not only drain water, but can hold fish finder transducers or anchoring systems. The Prowler 13 Angler doesn’t include a rudder, but has great performance and tracking, easily handling 30 mph wind gusts. Install an additional rudder kit, and the Prowler 13 takes on the choppiest waters. 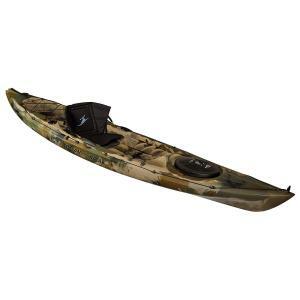 With a slim-lined design, this best-rated fishing kayak is fast yet stable, a must for any fishing kayak. Made from durable UV-resistant nylon, the Comfort Plus seat has a high backrest and four position adjustment for comfort. A little on the heavy side at 56-pounds, the Prowler 13 might require help moving it to and from the water. The two handles on the side of the cockpit and the retractable handles on the bow and stern help with transportation. When looking for the best fishing kayak under $1000, a top consideration is ease of maneuverability and excellent tracking. 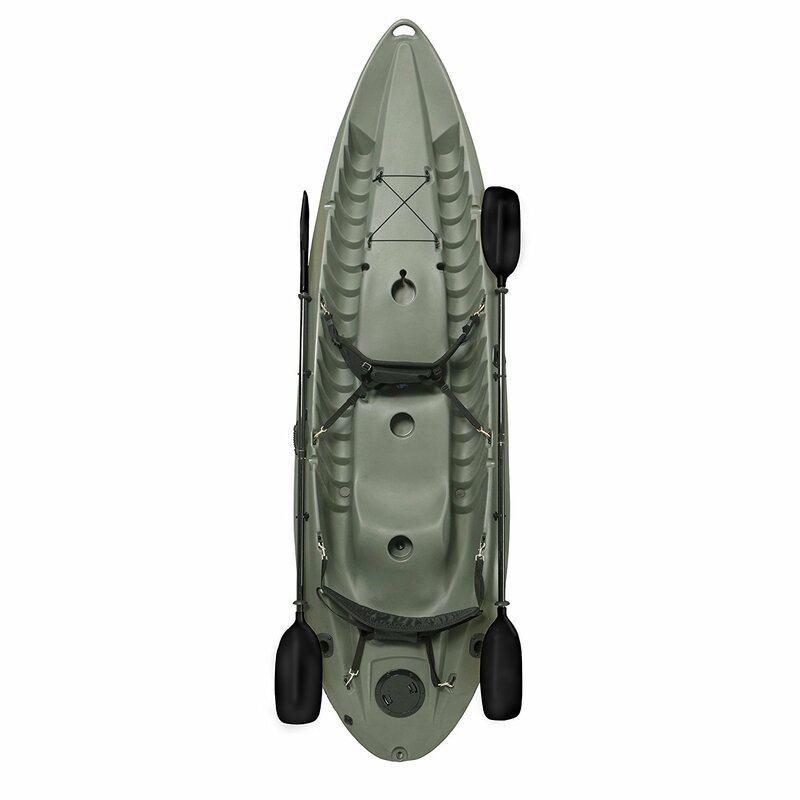 The UH-TK181 fishing kayak has a unique design with handling features not normally found in a tandem kayak. While most fishing excursions happen in calm water, sometimes you may encounter rougher currents when paddling to your perfect fishing spot. The design of the UH-TK181 keeps this in mind with its balanced hull for maximum stability. The UH-TK181’s supreme stability and excellent tracking ensure easy maneuverability and interruption free fishing. With a maximum weight capacity of 450-pounds, the UH-TK181 fishing kayak easily handles two adults plus fishing equipment and gear. Two boat hatches and a large gear compartment with bungee system gives enough room for fishing equipment and supplies. The seat back storage adds extra room for your personal belongings. Storage isn’t the only consideration in this clever fishing kayak design. When it comes to comfort and ergonomics, this boat has high-quality comfort for longer fishing expeditions. Large enough for most paddlers, the included seats come with fully adjustable backrests. Additionally, the kayak offers footrests for both paddlers, two bungee paddle rests, three adjustable rod holder mounts and four flush mount rod holders. 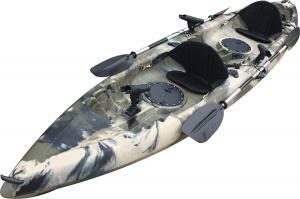 This kayak gives the die-hard angler the perfect kayak fishing features and accessories. The Feelfree Lure 10 is a smaller kayak that’s easy to maneuver and great for short fishing trips on rivers and lakes. This might be the best fishing kayak under $1000 for young or beginner paddlers, due to its extra wide beam of 36 inches. One of the highlights of the Lure is its removable, multi-height adjustable Gravity Seat. This ensures extra comfort when your paddling to a fishing spot or taking a break! Other comfort features include molded-in handles and Feelfree’s Wheel in the Keel. This feature is a small wheel under the hull, so you can avoid dragging the yak along the ground. A padded standing platform means you can paddle and even cast while you’re sitting or standing. For your gear, you’ll find a large tank well behind the seat. There’s a sealed hatch at the bow and a center console for smaller items. The Lure includes a Uni-Track system for mounting accessories, so you won’t need to drill holes into this kayak. You’ll find flush mounted rod holders behind the seat and bungee paddle holders at either side. Lastly, durable construction means that this stable, comfortable kayak will stand the test of time in the sun and on the water. The Sun Dolphin Excursion boasts an innovative design with the angler in mind. This sit-in boat could be the best fishing kayak under $1000, as it takes you where the fish are biting. Ruggedly built, the Excursion should last for years, with its UV-resistant hull made of Fortiflex® High-Density Polyethylene. This single person watercraft offers stability with great tracking and excellent portability. With retractable carry handles and weighing only 47 pounds, the Dolphin Excursion easily moves to and from the water. A large open cockpit holds a seat with adjustable and padded backrest, covered console, and protective thigh pads. The generously sized cockpit with its adjustable foot braces accommodates paddlers of most sizes. 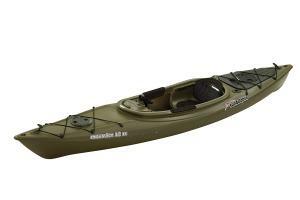 The Excursion’s 12-foot length gives you a fishing kayak that tracks well with great handling and maneuverability. Just put this kayak on the lake or river and point it wherever you want to go. One swivel fishing pole holder and two flush mount pole holders give the fishing enthusiast different placement options. You get sufficient storage in the Excursion with a standard storage compartment and accessory carrier that’s waterproof, convenient and portable. Shock cord deck rigging stores extra gear or secures paddle blades, while a built-in water bottle holder keeps your drink close. The Excursion may not handle well in choppy or rapid waters. The Lifetime Sport Fisher Kayak is the best fishing kayak under $1000, as reported by many satisfied owners. With its balanced and sturdy design, the Lifetime Sport Fisher could be the best fishing kayak under $1000 for you. 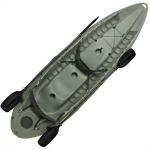 An intelligently designed hull gives this fishing kayak amazing tracking with great stability for stand up fishing. This kayak fits up to three anglers yet it’s light and easy enough to use by yourself. Adjustable footrest positions accommodate any size paddler. The durable high-density polyethylene (HDPE) construction is UV-protected for resisting fading, peeling, and cracking. The Lifetime Sport Fisher makes transporting easy with its light 60-pound weight and built-in carry handles. Whether you’re by yourself or with a buddy, moving this lightweight kayak to and from the water is a breeze. With the amazing accessory bundle included with the Lifetime Sport Fishing kayak, you have more money for fishing rods and tackle. A rear storage hatch helps keep your gear dry while included shock rope straps secure gear to the kayak hull. You also get an accessory mount to attach a trolling motor or rudder and scupper holes for draining the cockpit. Could be difficult to maneuver in windy conditions. The short length makes kayak speed slow. In order to buy the best fishing kayak under $1000, first determine where you want to take it out on the water. For example, if you love to go on longer journeys, you might wish to choose a longer kayak. On the other hand, shorter kayaks are easier to store and maneuver. However, they may not offer enough space for extended trips. Next, consider whether a sit-on-top or sit-in kayak is best for you. Sit-on-top kayaks generally offer great storage and, if by chance you flip, it’s easy to hop right back on. Sit-in kayaks keep you drier while fishing, which makes them perfect for cold water environments. For most fishing enthusiasts, a kayak that’s really stable makes the sport more enjoyable. Therefore, look for a kayak that’s wide. If you want to pick up speed, longer, narrower yaks are best. Most importantly, make sure the kayak you choose has enough space for your fishing gear and that you’ll be comfortable for long stretches of time. Once you’ve found the best fishing kayak under $1000, you can get out on the water and look forward to a great catch! Can’t get enough of fishing kayaks? Check out the Best Hobie Fishing Kayaks.